The exhibit opens in Rio de Janeiro, Brazil. Photo by As Cidades Somos Nós. 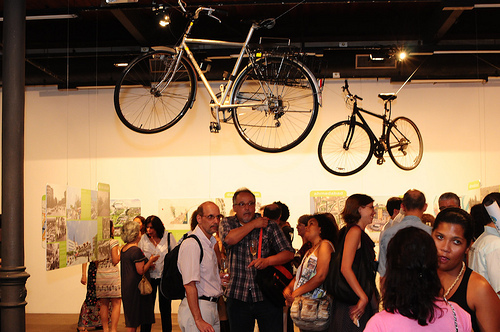 A traveling exhibition about the future of urban areas opened yesterday in Mexico City and Rio de Janeiro. It showcases the vision of 10 leading architects who imagine urban life in 2030, when “60 percent of the global population – or five billion people – will live in urban areas, mostly in the developing world.” Our Cities Ourselves builds on “10 Principles for Transportation in Urban Life” created by the Institute for Transportation and Development Policy (ITDP) in consultation with Jan Gehl, a world-renowned architect and urban design consultant. The exhibit and its corresponding principles show how sustainable transportation solutions can manage growing urban populations and address environmental concerns. The exhibition will be open for the next month and will feature a host of seminars and events with local and international urban planning and transportation experts.